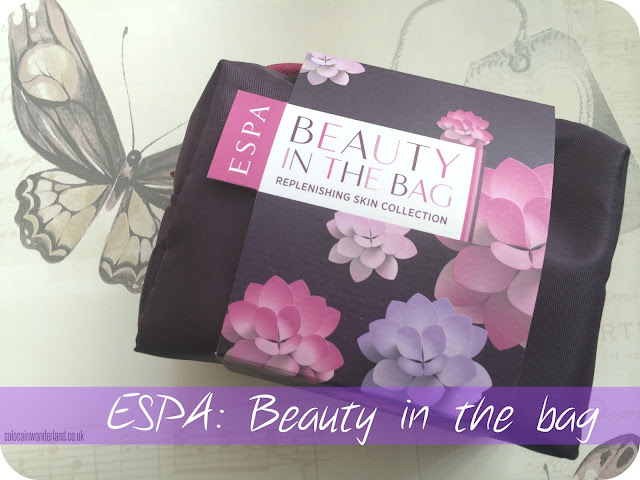 When ESPA invited myself and some lovely local bloggers to an exclusive event in Beauty Bazaar, Liverpool, one of our little treats was a detailed skin analysis with one of the ESPA beauty therapists. After my analysis, it was decided my skin was a little dry and in need of some hydrating TLC. 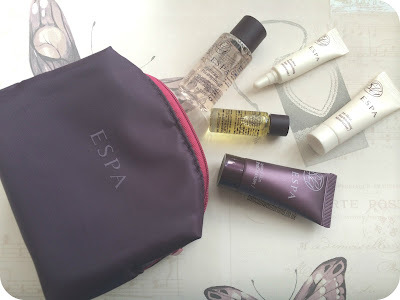 I was presented with this adorable little cosmetics case that contained a little bit of everything ESPA I would need to replenish my skin and give it a hydrating kick up the derrière! ESPA’s Beauty in the Bag have been fantastic little ‘gift with purchase’ (GWP) for sometime now and they are a brilliant way to introduce you to an entire skin care system based on your skin type. Most GWP’s tend to be tote bags, like you get with almost every bottle of perfume you buy - don’t get me wrong, these are useful, until you find your home overrun with tote bags! I love a more useable GWP - and as you know, I’m a huge fan of their introductory kits, which give great value for money if you’re looking to try out a few different products from the same brand without forking out a fortune! My little beauty bag contained; Optimal Skin ProCleanser, Hydrating Floral Spafresh, Optimal Skin ProSerum, 24-hour Replenishing Eye Moisturiser and 24-hour Replenishing Moisturiser. 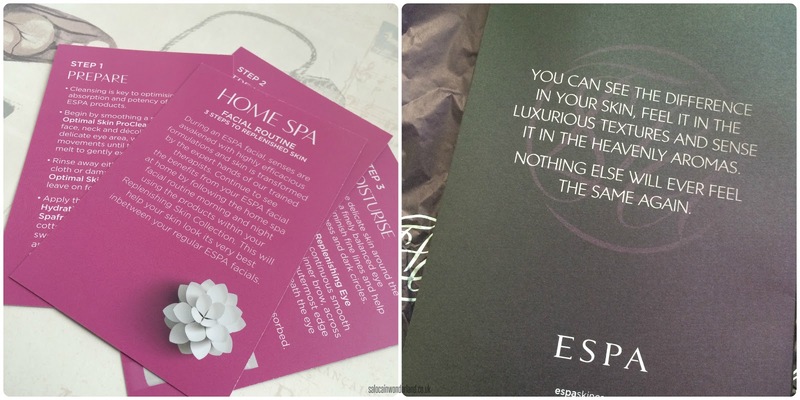 It also contained some handy little flash cards that told me step-by-step how to recreate a ESPA facial routine. You know me and my home-spa evenings! I’m all about the at-home pampering! Though I received the Replenishing collection, there are several others, all designed to treat your skin for any and all ailments it might have. They also have slightly bigger versions of these beauty bags for purchase, including one for men that I really want the Mr to try out! Everything in the bag works in harmony, balancing benefits and fragrance to create a pleasant and uplifting little skin care routine. I was weary of using so many rich, moisturising products on my usually oily-prone skin but have found that by using them once a week or so, I can give my skin and intensive, nourishing treatment without getting all slicked up. Turns out even oily skin can be dry! Who knew! I find this is a great little skin SOS kit and ideal to have on hand when the morning after the night before hits and you need some extra TLC from top to toe! I’m even keeping it all in the little cosmetics bag, as well as a few extra skin-mergency products as my go-to SMS kit - Save My Skin! 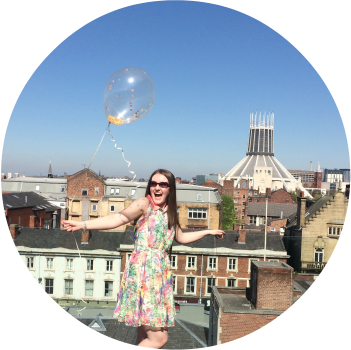 What’s your favourite kind of GWP? Do you have an emergency skin care kit? Let me know in the comments below! I had this but didn't use it all together. I wish I had now! Doom. I love the smell of it but it can be a bit overpowering for daily use, I found. It does smell really strong, I couldn't use it every day, that's just a bit too much but once a week is a damn fine treat! it does smell very 'spa-esq' so I can at least pretend my bathroom is some kind of luxurious resort! Yay imagination haha!